Visit of Carmelite Father General William of St. Albert to Grand Rapids Carmel in 1934. He gave the black veil to Mother Teresa Margaret (kneeling left) and a companion, after their solemn profession. Mother Elias is standing directly behind him. Over the years of our monastery’s history, some minor simplifications to our traditional habit were introduced. In 2015, the 5th Centenary Year of the Birth of St. Teresa of Jesus, we decided to restore the distinctive elements of the original habit worn by our foundresses, to better express our Spanish-Mexican heritage, most notably the larger toque and gathered veil. Most of the photos featured on this website were taken prior to this restoration. A crown, for the Child King and also for her whom all Carmel calls its Queen. 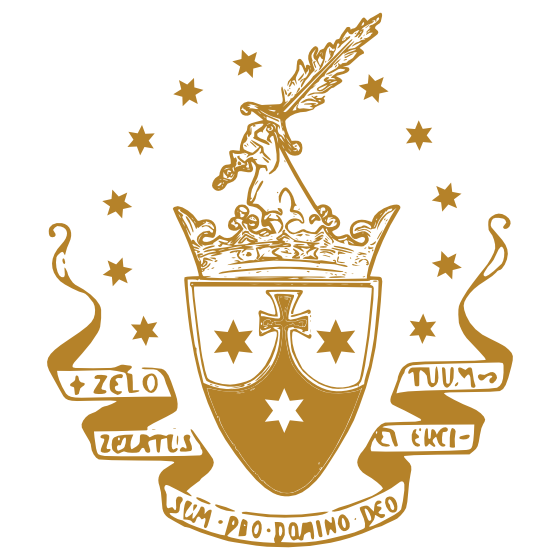 A six-pointed star, as used on the Carmelite Shield (the large stars signifying the three phases in the Order’s history, and the twelve stars above the queenly crown for Our Lady) which is also reminiscent of the Star of David and the Magi star. The third page of this website describes how stars had a role in our own foundress’ vocation. A briar rose, a medieval symbol of our Lady often used on liturgical embroidery. The blue background to our website is taken from an old damask pattern called Tudor Rose, from our collection of ornate fabrics used for making vestments for the Infant of Prague and for Mass. We hope someday soon to resume this treasured work. We also chose the crown and rose motif as the elements to customize the Corinthian capitals which flank our tabernacle altar during the chapel renovation. Heartfelt thanks to Bill Powell of Wineskin Websites who developed this website and with infinite patience and contagious enthusiasm taught us to maintain it. And thanks also to the folks at WordPress who make websites like this affordable, easy to use, and to their cheerful team of Happiness Engineers. Artist Ben Hatke drew the crown logo for the banner. The Carmelite Nuns of Alhambra Carmel graciously gave permission to use their stained glass window of St. Teresa with the Child Jesus. The photo of Benedict XVI in Prague is by Grzegorz Galazka from an article about the Shrine Church in Prague used with permission of Inside the Vatican magazine. The aerial photos of the monastery are courtesy of Jim Anderson. The leaf from a Flemish Antiphonary is from the Walters Art Museum. The painting of Pope John XXII (1316-34) confirming the decisions of previous Popes, shown above him among the angels with bulls in their hands, recognizing the Carmelites as an approved religious order is by Pietro Lorenzetti (ca. 1280 – 1347) located in the Carmelite church in Siena, Italy. The bull of Gregory IX dated May 9, 1234 granting requests of a Cistercian monastery in Poland was shared by Karol Zglinski. The photo of the rood screen in the St. Etienne du Mont Church in Paris is by Jastrow.